After bidding our farewells to Anita and Gary yesterday, it was time to board the bus and head for our next stop, Malacca. It was sad to leave them both as we have got used to being around them and have enjoyed their company very much. I'm also going to miss my auntie's daily phone calls. She phones me up from work about five times a day on average - wondering if I am ok, where I have been to, whether I have eaten etc. It, therefore, did not come as a surprise when I got a call from her ten minutes in to our bus journey to check if we had got on the bus OK! It took two hours to reach Malacca's new bus station (6km from the centre of town, if you believe the taxi drivers) and by the time we checked into our hostel near China Town, it was quite late. The past week's late evenings and early mornings had finally caught up with me and I fell asleep almost as soon as my head touched the pillow. After a long night's sleep, we ventured out to check out the sights of Malacca this morning. This town is probably famous for two things. Firstly, its historical architecture; influenced by the Portuguese, Dutch, Chinese and Indian, amongst many others. 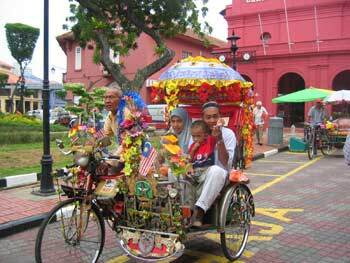 The reason being that by the fifteenth century, Malacca had become an important port in Southeast Asia and as a result, attracted many to conquer its shores. Every country that did so contributed its own architecture to the town. 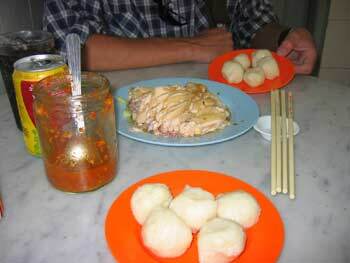 The second thing that Malacca is well known for is its chicken rice - a Chinese-Hainan speciality that came highly recommended to us by the locals, namely Gary, Siew Ling and Ching Yee. "Yes, you must try this - it's delicious!" The best thing about the attractions is that they are all close to each other and are within easy walking distances. We passed the many beautiful Chinese-Peranakan shop fronts that line Chinatown. The district appears to be stuck in time and looks just like how I imagine Shanghai to look in the 1920's. This place also reminded me of a town called Hoi An in Vietnam. The shop houses are well maintained and every now and then there would be a colourful temple in between the cluster of shops. We passed a few of these, including Malaysia's oldest Chinese temple, the Cheng Hoon Teng Temple, dating back to 1646. The occupants seem to be having difficulty seeing over all the junk that's hanging off of this tri-shaw. Our next stop was the Town Square, where there is a concentration of red Dutch colonial architecture. A windmill, clock tower, church, town hall (Stadthuys) and a number of museums border the square. It felt like we were in Europe (if we forgot about the heat for a moment). The traders made the most of the footfall; tri-shaw drivers, food and craft hawkers and other inventive traders tried hard to relieve us of a few extra Ringgit. 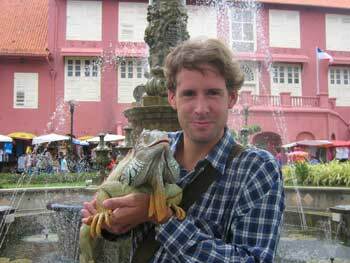 We succumbed to one such trader, by agreeing to pose for a photo with his iguana for 3RM. Well, Ian did anyway. Ian is a big Mac fan, so he was keen to get his hands on the new iGuana. It was lunchtime and we managed to track down a restaurant near the bridge by the Town Square called 'Kedai Kopi Chung Wah', famous for its chicken rice. It was very busy in the restaurant and after ten minutes of waiting we found a space. The food was delicious; the chicken had been marinated in fragrant spices and served cold. The rice was moulded into small round balls and came on a separate plate. The bill, including soft drinks, came to a reasonable 14RM (£2). It was definitely worth a visit. Another Malaysian dish to cross off the (long) list! Chicken rice - so called because there's chicken. Oh, and there's also rice (that's the white balls in the front there). After lunch we walked up Bukit St Paul (St Paul's Hill), accessed via Stadthuys. At the summit sits the Portuguese St Paul's Church. There were many tourists at this spot but maybe as a result of the buskers playing relaxing music, it didn't feel manic. After taking a few snaps, we made our way down the other side of the hill. At the base lies A'Famosa, the ruins of a Portuguese fort, after the Dutch invasion. Not much is left of the fortress but, again, there was no shortage of tourists. Ian was grinning like a Cheshire cat when I next caught up with him. I'd been sitting inside the ruins, taking shade up until that point. He was very happy as a Muslim lady told him that he was handsome and proceeded to take a photo of him. Then the floodgates opened and the rest of her tour group came over to have photos taken with him. Apparently, they'd taken about seven photos in total and obviously found it a novelty posing with a westerner [Ian adds: 'cos I can't see any other reason why they'd want to!]. It's amazing what a little flattery can do. If Ian had adopted the iguana's pricing system, he'd be 21 Ringgit better off! Our final stop was at the Maritime museum which was closed today. We took some photos of the large boat anyway before making tracks back to the hotel. As if by magic, my auntie phoned the moment I stepped into the hotel room. "Yes, auntie. I tried the chicken rice and it was very good, thank you!"